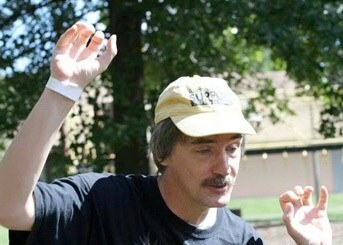 Tom was interviewed for the Bryn Mawr Film Institute BMFInsights blog by intern Erin Korth. Click here to read why Tom loves Open Screen. Tom’s video “Nevertheless, She Persisted” was selected by CineKink NYC 2018 Film Festival. Tom attended! Tom & Doug’s video interview in honor of Andrea Rossi’s birthday was selected for GeekFest Toronto 2018! It was the 7:30pm block on Feb. 14, Tom attended! 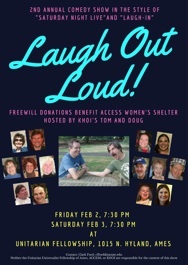 Tom & Doug hosted the 2nd Annual Laugh Out Loud LIVE comedy show at the Unitarian Fellowship in Ames, Iowa on Feb. 2 and Feb. 3, 2018. Stay tuned for new songs and videos! Tom and Doug’s version of “Black or White” awarded “Best Cover” by American Tracks Music Awards! “The Best of Cafe Improv, 2017” performances on Vimeo.